Dimensions 1.50 by 7.25 by 8.75 in. Amazon.com description: Product Description: This text gives equal treatment to both HTML and XHTML, covering all new HTML 5 features while highlighting the differences between the languages. 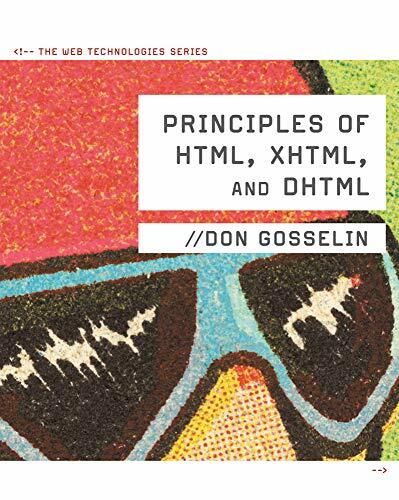 The book will also include enhanced coverage of DHTML, as HTML, X/HTML, and DHTML are commonly taught in the same course. Each chapter provides clear, non-technical explanations of the important concepts and techniques of a particular language or tool. The focus, however, is on learning-by-doing as students complete typical Web authoring tasks, such as adding tables to Web pages. from Course Technology Ptr (December 1, 2010); titled "Principles of HTML, XHTML, and DHTML: The Web Technologies Series"
About: This text gives equal treatment to both HTML and XHTML, covering all new HTML 5 features while highlighting the differences between the languages.